Recent lung transplant recipients will spend recovery holding their breath after UPMC researchers linked a common complication with a shorter lifespan. This April, researchers at UPMC published in the journal of Thoracic and Cardiovascular Surgery that nearly a third of lung transplant recipients experience atrial arrhythmia — a condition in which the heart doesn’t beat with the proper rhythm — following the transplant operation. The researchers also found, after correcting for other factors, that lung transplant patients who experienced atrial arrhythmia have higher mortality rates compared to patients who did not experience the condition. According to study author and Pitt associate professor of cardiothoracic surgery Jonathan D’Cunha, the link between atrial arrhythmia and mortality surprised the researchers. “Usually, you would think something that happens short-term is treated, it’s done with and it doesn’t have that ripple effect downstream,” D’Cunha said. When patients are in stable condition following surgery, doctors treat atrial arrhythmia with drugs, D’Cunha said, but for unstable patients, doctors may have to resort to defibrillation — delivering a controlled electric shock to the heart — which allows the heart to begin beating again normally. Doctors are usually able to correct the arrhythmia while patients are still in the hospital. 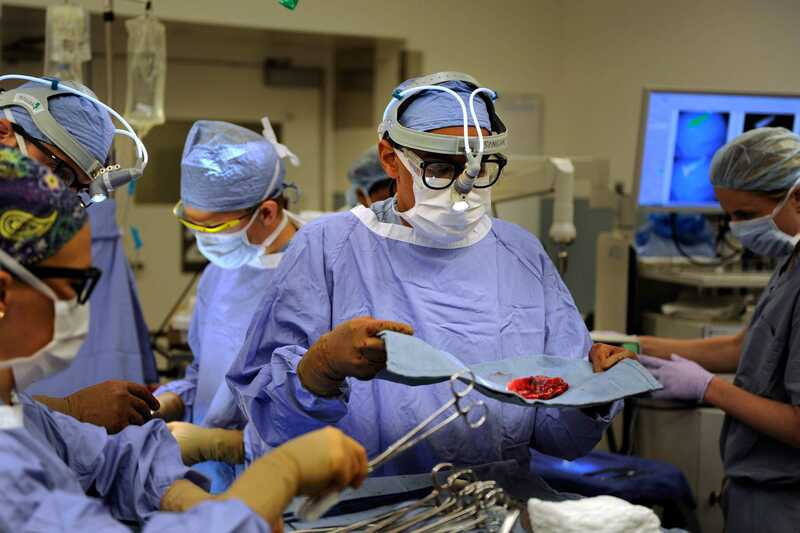 Among the 652 patients who received a lung transplant from 2008 to 2013, about 30 percent experienced atrial arrhythmia, usually within a week or two of the surgery. Five years after lung transplantation, about 55 percent of patients are still living, D’Cunha said, but the UPMC study has found that postoperative arrhythmia is associated with 1.63 times greater risk of death within the five years following surgery. According to first author Alex D’Angelo, there are several theories as to why lung transplant could lead to atrial arrhythmia shortly after surgery. One possible explanation is the body’s response to trauma and inflammation caused by invasive chest surgery, D’Angelo said. In the days following a transplant operation, chemicals known to impact heart rate flood the chest cavity. It is also possible that making incisions around the heart creates scarring, which can disrupt the normal flow of electricity that synchronizes heart muscles into a steady beat, D’Angelo said. Stephen Fonash, a State College, Pennsylvania, resident, was 71 when he received a double lung transplant at UPMC Presbyterian Hospital in 2013. Fonash underwent the procedure to treat idiopathic pulmonary fibrosis, which is characterized by scarring of the lungs that impairs breathing. About two weeks after the transplant operation, Fonash experienced atrial arrhythmia. According to Fonash, doctors stabilized his pulse with medication. “I was surprised because I’ve never had anything like that happen before,” Fonash said. To mitigate this kind of surprise for future patients, D’Cunha now educates his lung transplant patients about likely complications before the operation. Stephanie Rath, then age 45, drove all the way to UPMC Presbyterian Hospital from Indianapolis in 2013 to receive her double lung transplant as a result of cystic fibrosis. She also experienced an atrial arrhythmia within two weeks of her surgery. It is unclear, according to D’Cunha, why an acute event that happens within several weeks of surgery might have a relationship with mortality years later. D’Cunha suspects side effects from treatment of the arrhythmia could be to blame. According to D’Angelo, the isolated arrhythmia event may also cause subtle damage to the heart which manifests years later. “There could possibly be some kind of chronic remodeling, or restructuring, of the heart with the acute event, ultimately weakening the pumping mechanism and leading to long-term mortality as opposed to a short-term problem,” D’Angelo said. According to D’Cunha, preventing arrhythmia through close monitoring and preemptive treatment may be the key to reducing mortality rates.